The weather might already be chilly where you live. That chill may have you thinking about chili. And what’s a steaming bowl of chili without an accompanying slice or two of moist, delicious cornbread? Fortunately, these hearty filling dishes can be made with little difficulty. Start your chili first, since it takes a while to prepare. As it simmers, kick back with your fuzzy socks and favorite book while you bask in the wonderful aroma. Welcome to autumn! 1 package vegan crumbles (2 ½ cups) Beyond Meat makes a wonderful crumble–robust, yet gluten and soy-free. It’s comprised of pea protein and other nutrients. If you use soy crumbles, check the package to make sure they aren’t seasoned with soy sauce, which contains wheat. For fastest results, soak the black and pinto beans overnight to soften. Combine beans with water, tomato paste, crumbles, and other ingredients, adding carrot and parsnip first, then progressing to softer vegetables such as scallion and tomato. Simmer at low heat for 2-3 hours on stove (4-5 hours if you use crock pot, our preferred method). Your concoction will smell amazing! Serve as is, or with a sprinkling of vegan cheese. 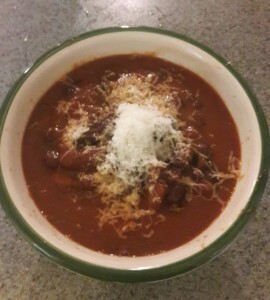 This chili keeps well in the refrigerator and tastes even better after a couple of days. Serves 6. Pour almond milk and vinegar into the bowl first and let them curdle for 5 minutes. Gradually add other ingredients, making sure your mixture is creamy and foamy but not thin or lumpy. Add more almond milk or flour for desired consistency. Grease square baking pan with olive oil and pour in your batter. Bake for approximately 30 minutes, until top is golden brown and slightly cracked. Serve with vegan butter, Earth Balance, maple syrup, or as is. Serves 6, but two people can make quick work of this cornbread over the course of a couple of days. Enjoy! Enjoy the crisp autumnal breezes with a bowl of delicious vegan chili and a slice of rich, moist vegan and gluten-free cornbread. Hearty and satisfying.